Commuters pedal down Manchester Street on their way to work in 1954. 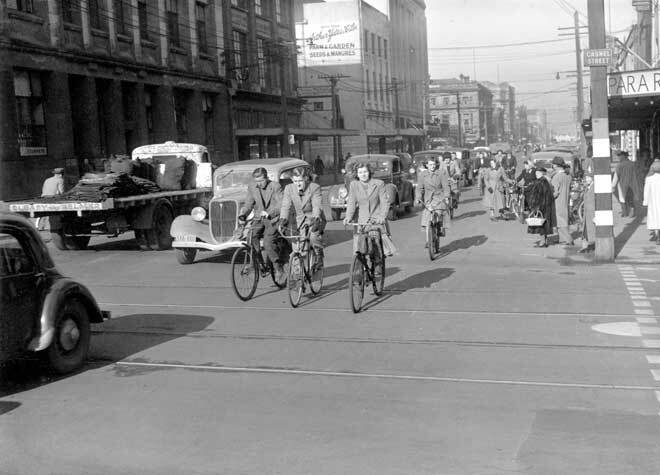 In the early 20th century Christchurch, with its wide flat streets, was nicknamed ‘Cyclopolis’ because so many people in the city rode bikes. What a wonderful photo! The gentleman on the bicycle on the far left is my grandfather Sylvester Francis Muschamp. It's amazing how far bikes have come! I don't fancy those penny farthings as being much good offroad! The Charlie the chimp film wouldn't be too politically correct these days!